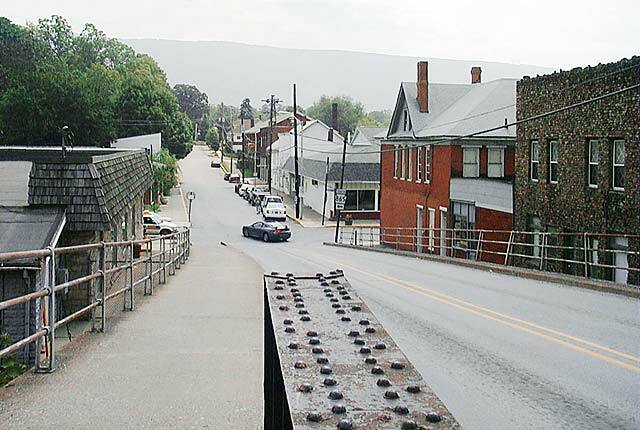 This view off the Bridge Hill is looking southeast down South Cambria Street. The intersecting street at the bottom of the short hill is Main Street. One of the older surviving buildings in town is the red brick structure on the near right corner of the intersection, along with the creek-stone apartment building next to it. Norfolk Southerns three mainline tracks pass directly under where I was standing to snap this photo, with Brush Mountain looming in the distance to the southeast.